I am working the best wedding right now. My fave band always, have been extended 1 hour, dancefloor full. 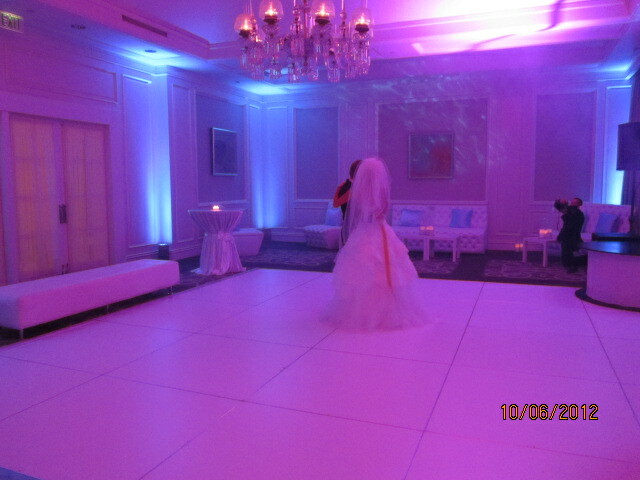 Great bride & groom, awesome decor/color scheme. This wedding was referred to me by one of my fave past couples, who are here. I was soooooo pleased to see them, and the funny thing is, we are here at Balboa Bay Club and the photographer we used for their wedding was not available on this date so I could not offer him (we still got another good one) and low and behold he is in the ballroom doing a wedding, so I went and grabbed him so he could say hi to our past couple. Posting pic tomorrow of me and my past fave couple. Posting pics from this wedding in a few weeks. Over the past few years we have had technology, and couples have tried to work out how to have grandparents or special people who can’t make it to the ceremony, be able to see it live. We went through companies offering live streaming which was expensive, and last year for a very ill mom a videographer taped the ceremony and went immediately to the mom’s home/bed and she was watching it 15 mins after the cere. Not sure why it was hard, maybe wi-fi issues or things, but ……. A dear friend of mine died in New Zealand on Sunday and the funeral was going to be Thursday/our Wednesday, so there was really no time or way that I could drop everything and head down, so I asked one of my friends that I oovoo with (I find it a clear image than skype) would she take her iphone and oovoo me on it and hold it so I could watch the service. She did much better, she hooked her phone to her ipad and put me on a stand at the back of the aisle, so I had a great view down to the casket and looking at the pews full of friends/family. Prior to the service people were coming to the ipad and saying hi to me and afterwards they walked me around the friends/family standing outside by the hearse so we could say hi or chat further. Total of 2 hours of being there and being involved with everyone, yet sitting here in S CA in my home. So next time you have someone far away that can’t be there but really wants to be or you really want them, do this same/similar setup, it was priceless, and literally it cost nothing. Had a fun journey with this lovely couple of mine. When they first came to me my bride had an inspiration picture, it was a church ceremony with lots of candles down the aisle. The bride grew up in San Diego and preferred to do everything in that vicinity, but based on my couple of meetings I had had with them to this point, I was visualising what I thought would be their perfect celebration. So we started in San Diego, the ceremony feeling had expanded to a more cathedral look, and in S CA we are limited with those kind of churches/chapels, and San Diego limits it even more, but we did find two chapels that would work, great, now time to find the reception location. We visited around 8 different locations, some the more traditional ballroom look, but a couple with a twist, one of which I thought would be perfect. The Groom loved the one I thought would be perfect, unfortunately what I did not know, was I did have them pegged, and that was where they had recently held her 30th birthday celebration, because it was exactly their kind of vibe/uniqueness & party atmosphere type location, but of course now I knew that, I had to agree with the bride, been there done that, so we needed to come up with another great idea. At the end of that day I had them follow me up to the Ritz-Carlton Laguna and I showed them my thoughts for doing the reception there. Each year I have a couple who is willing to let the hotel dictate the date based on how we want to use the space, and be willing to work with a higher F&B minimum even with a smaller group in order to use the property as we would like, and I felt they could be my 2012 couple. 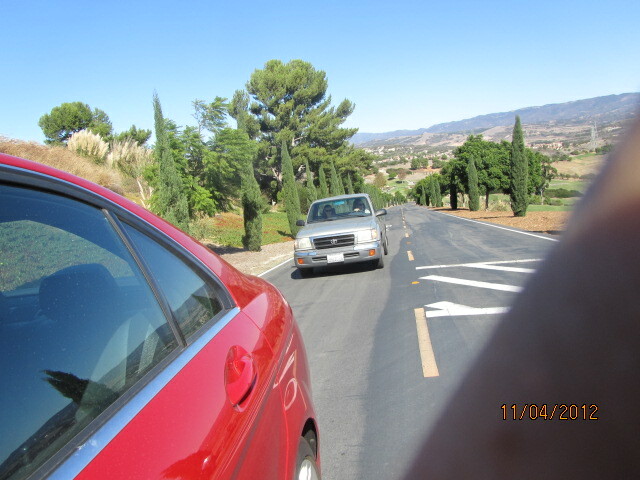 They liked the idea, but we were loving the cathedral in San Diego, that was too far to have guests drive, so what to do. 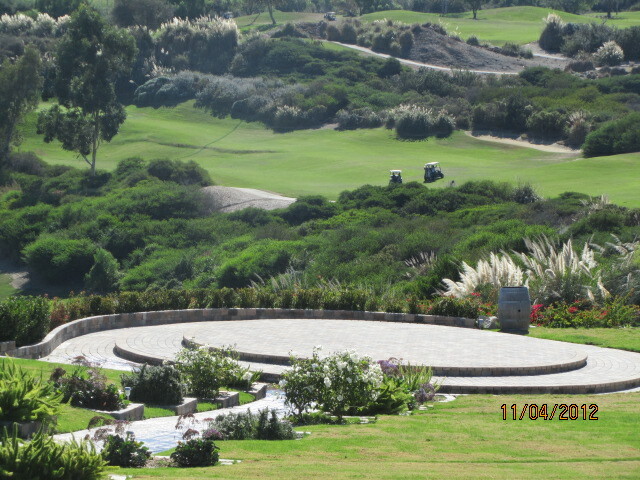 They looked at a couple of other reception locations but there was nothing in SD that fit their vision, so we focused on the Ritz-Carlton option, but now to find a church where we could get that feel/vision the bride had, it took a while, but finally Mariners Chapel in Newport Coast was it. 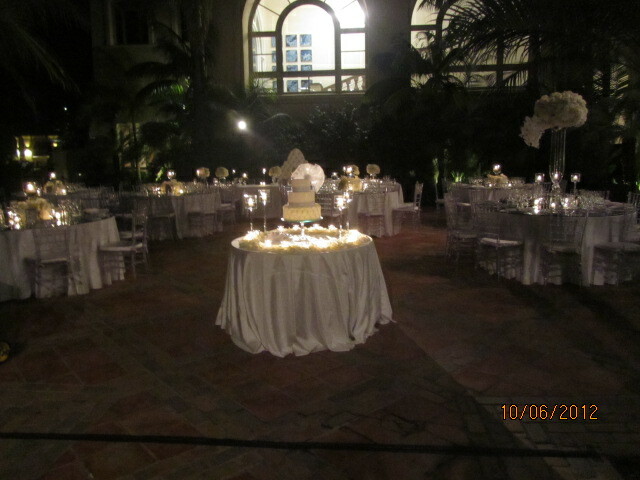 So we did a 7pm ceremony so we were sure of the darkness and the candlelight ceremony feel, then at the Ritz, the guests had cocktails on the balcony of the Plaza room, we then invited them to the courtyard where dinner and the wedding cake were served, then the guests followed the B&G to the party room (where we had go go dancers!!) and party they did until around 2am. It turned out fabulously. 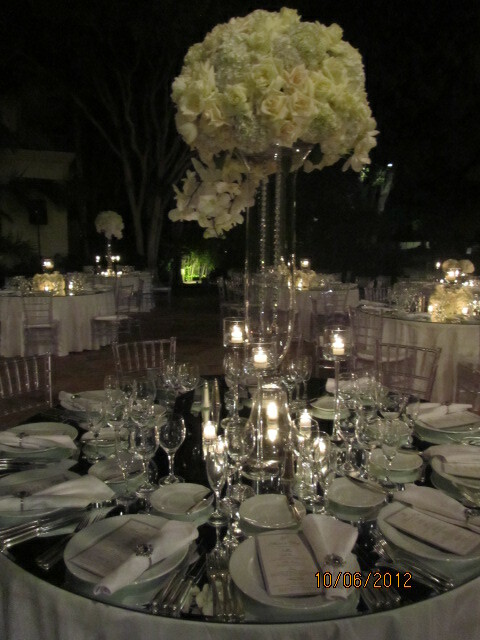 And proud to say, I was right on with the reception venue/my initial vision. But there are times we must go through the process/journey, so the final decision is known to be the right decision and you never second guess yourself or wonder what else may be out there. We had a great team on this one also, thanks to Square Root for the candle/floral vision becoming a reality, Fusion for the cool furniture look we created, my lovely Peter of Vive Entertainment for fitting in as always as a fabulous mcee and dj, and of course the wonderful team at the Ritz-Carlton all the way from Fernanda in sales who helped me make the space work, to the service and banquet team on the day. Had a great two day celebration with this great couple who live in Chicago. It was a 350 person wedding, and not one person came from San Diego, everyone flew in from all around the world and the USA. 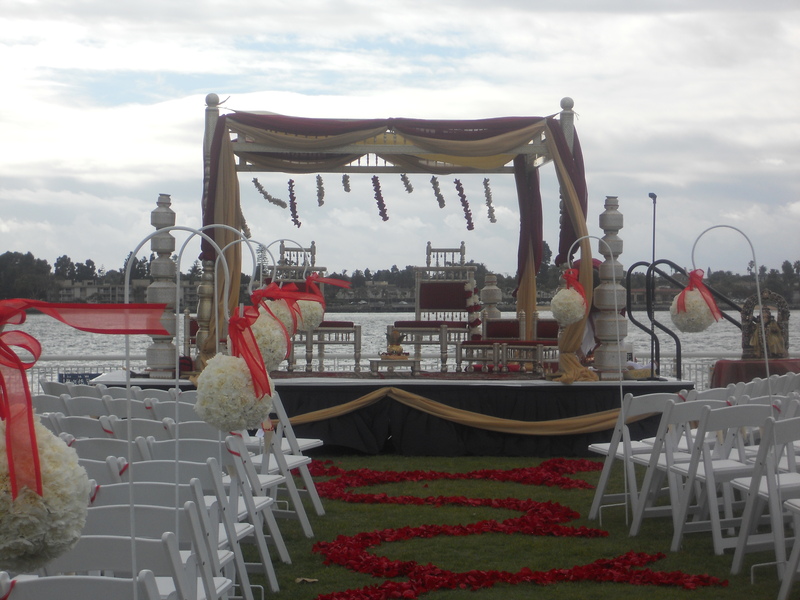 It was a December wedding and the couple chose San Diego because they knew the chances of an outdoor ceremony and people wanting to come to S CA, would be pretty good. They were right. 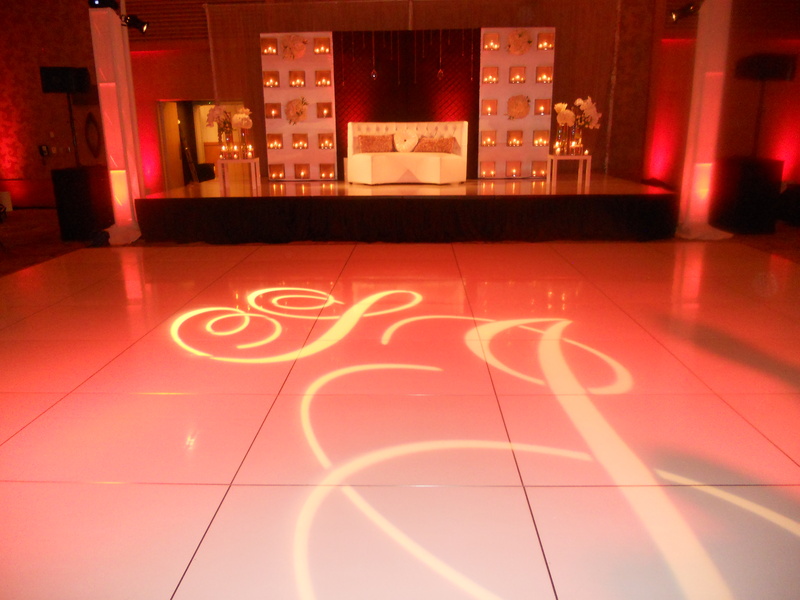 The sangeet was held at the Hall of Champions in Balboa Park, it was themed so we didn’t need to spend money on decor. 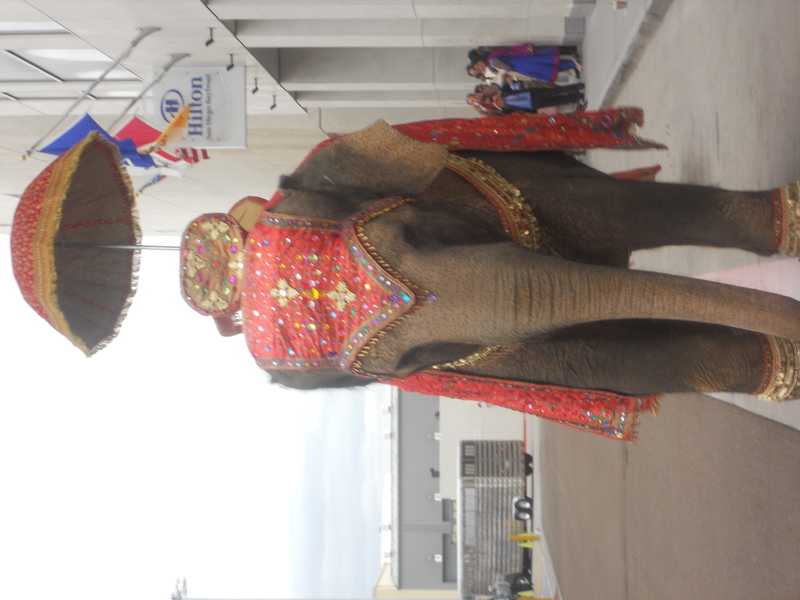 On the wedding day, we had two ceremonies, one earlier in the day indoors, then a second early afternoon on the lawn with the San Diego harbor as the backdrop (I can imagine in summer that has to look wonderful), and of course my Jigar came in on the elephant, he kept going back and forth on this or a horse, but he was a groom worthy of the elephant and it was perfect. The ceremony ended just as a good rain shower came down and it got a bit cool, but all that it changed was instead of the normal lengthy time of photos infront of the mandap with a lot of the guests, we did immediate family quickly and then the rest of the photos inside the hotel. Then everyone got to freshen up/relax, get ready for the evening event. The ballroom looked great, we had 3 different centerpieces which is a nice thing to do when you have 40 tables in a room to add a bit of interest/dimension, and the backdrop on the stage turned out fabulously. 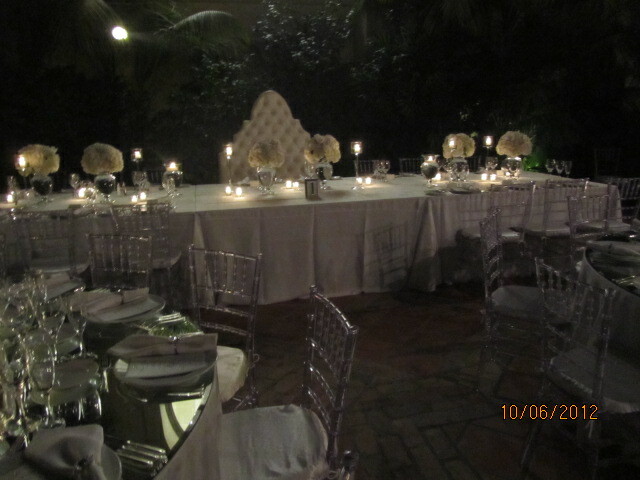 This is a new trend, panels being used at ceremonies and behind sweetheart tables, hips things up, and as with these panels when candles and flowers are added, it really looks fabulous. The night ended with the guests following the bride & groom down to the side entrance of the hotel where a Taco truck was waiting. We had a lot of fun when the couple were in town for meetings, the moms laughed a lot, and the groom kept me laughing. A nice wedding celebration to end the year with. A wedding celebration like this means a long list of vendors, so thanks to everyone involved, as well as the Hilton who were great to work with during the planning months and especially on the day. 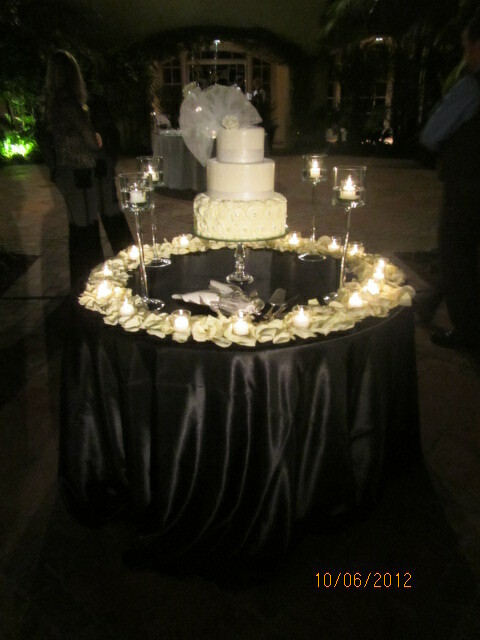 Teri did another great job with this wedding at the Westin, which was actually for one of our friends from the St Regis for her wedding. 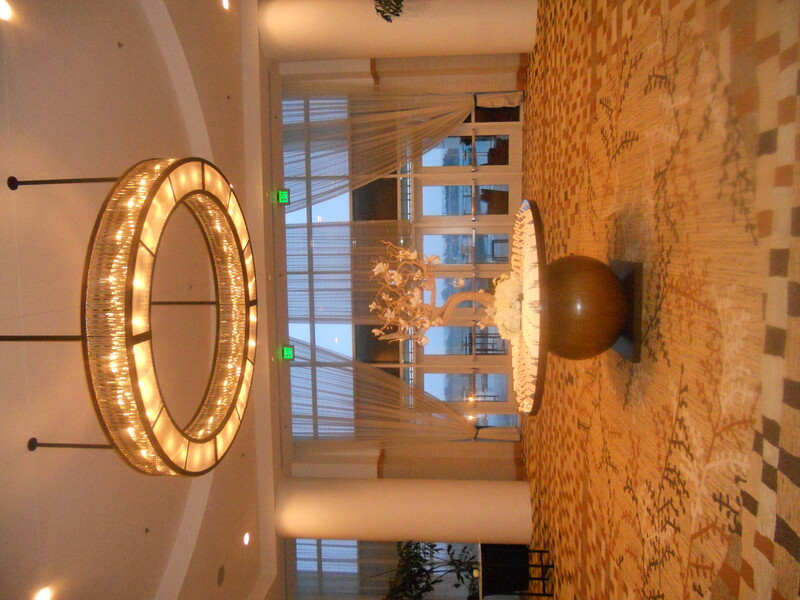 We have done a few weddings at this hotel over the past few years and we are loving the new lobby and look/feel of the hotel after refurbishment. This ceremony site is very unique with the waterfall behind, and how neat is this, you can turn the flow of the waterfall low during the actual ceremony and then back to full fall during cocktail time. 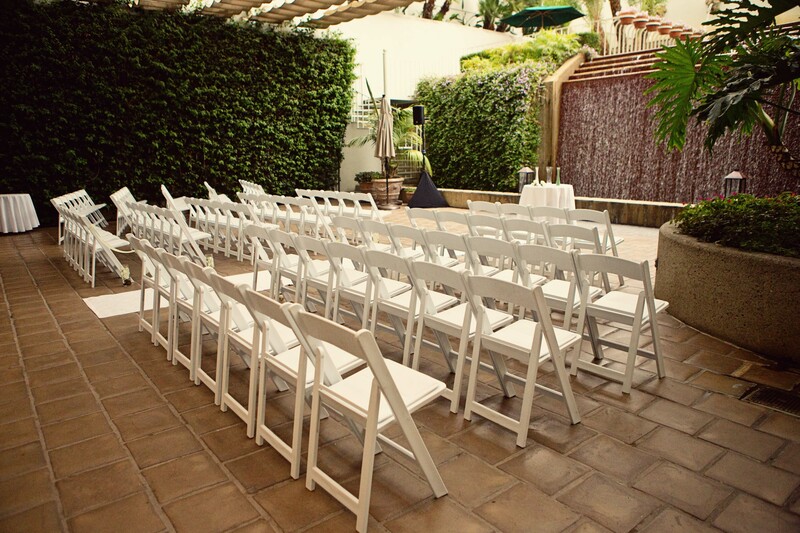 The banquet room is right off the patio, so your guests have access to the patio throughout the rest of the event. A great venue for a wedding of 100 or less. Here is a find in the southern OC that I just love. 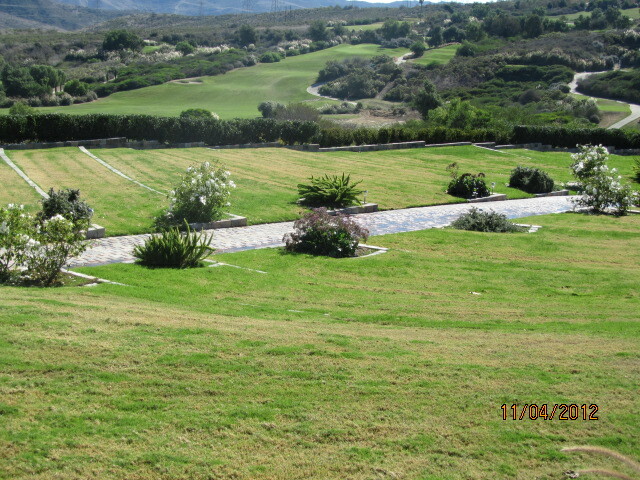 If you can’t afford the ocean, aren’t really wanting anything inland or too golfy, come and check this property out. 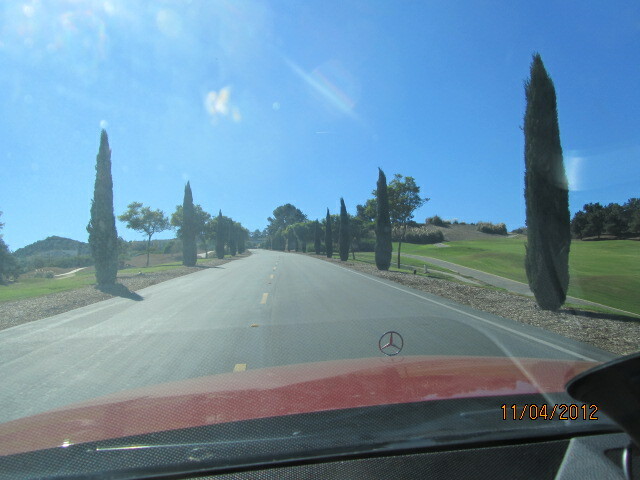 The first thing that strikes you is the drive down this lovely long driveway with cypress trees along it, you drive down down like a roller coaster ride, very cool, you see tinges of wine country, wine barrels etc along the way. 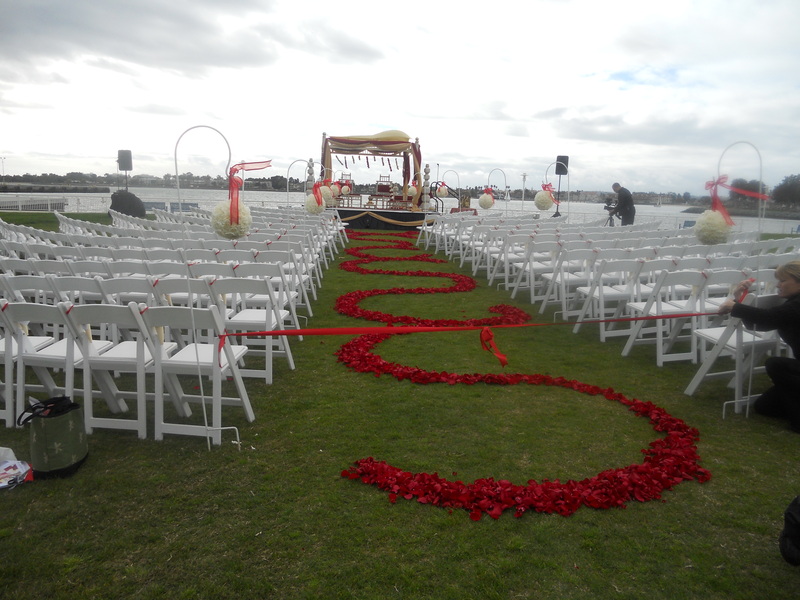 Then you head to the ceremony site, such a smart idea, the aisle goes down hill, so the guests are in ampitheatre seating, but the back row is the highest, so everyone has a great view. 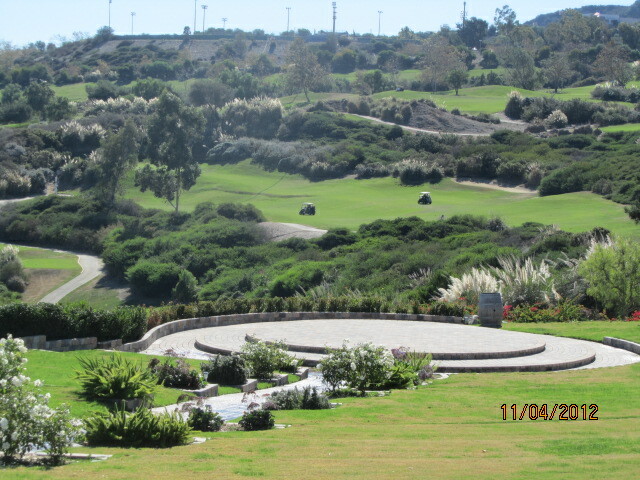 You get married on a round brick platform, and your background is rolling hills, infact everywhere people look it is rolling hills, who knew we still had so much open space in the OC. The golf course is there, but the difference between this and other golf clubs is, that is not the focus of the view, it is part of the view. 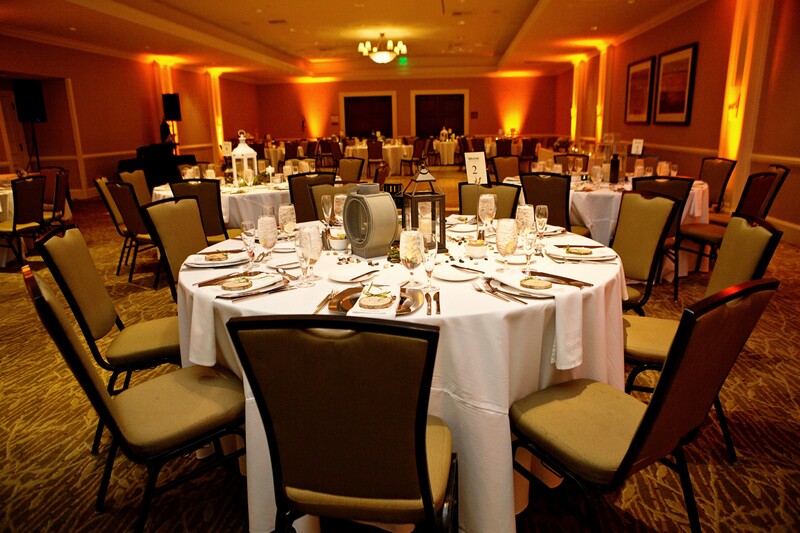 The dinner/dance is held in a large banquet room, that is the size of a small ballroom, difference here is, there are windows all around so until it is dark the view is still there, a fireplace gives the feeling of intimacy, and there is a balcony off to one side for anyone needing fresh air etc. You will be the only wedding happening, the building looks like a Southhampton lodge so gives the appearance of a home, the pricing is very hard to beat, and I think will become very hard to get a date at once more people find out about it. 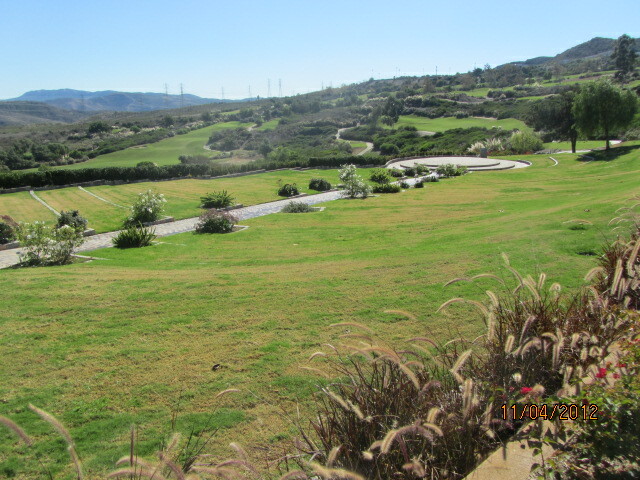 Let me help you book and plan your Bella Collina wedding.